The smooth glass screen of the new Pioneer AppRadio 4 (SPH-DA120) is quite stunning. The picture quality is very good and the new flush-sitting capacitive buttons make the device look like a tablet in your dashboard. But just like today's tablets and smartphones, glass screens have one problem. They are highly reflective and produce glare in bright sunlight. This can make things difficult to see on the screen, not to mention the fingerprint magnets that they are. In the last month or so that I've been using the AppRadio 4, I've had many occasions where the bright sunlight has made it close to impossible to see what's on the screen. This is especially annoying when you're getting directions to some place. 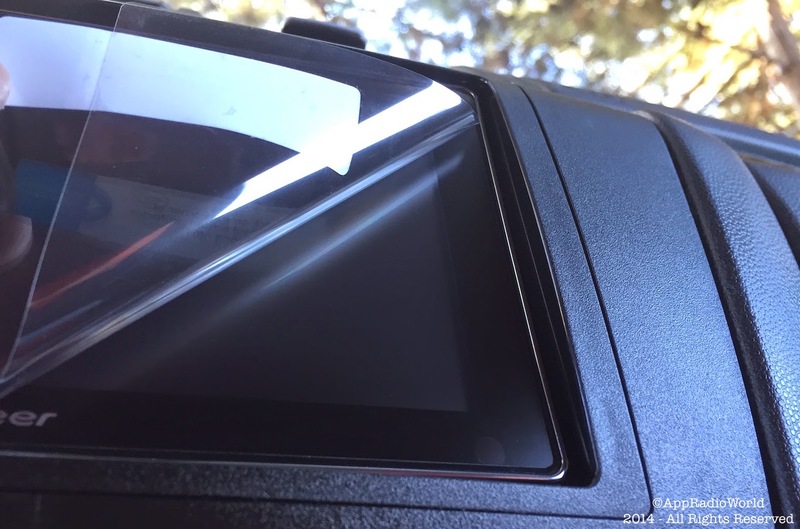 The issue may seem minor but it drove me to exploring for a custom-fit anti-glare screen protector. After looking everywhere for a perfect fit, I couldn't find anything made for an AppRadio 4. There are a few "custom-made laser-cut" screen protectors available for previous generation AppRadios but they can be a little pricey, and I wasn't sure if it will fit my AppRadio 4. I used the metric scale for more accurate measurements. 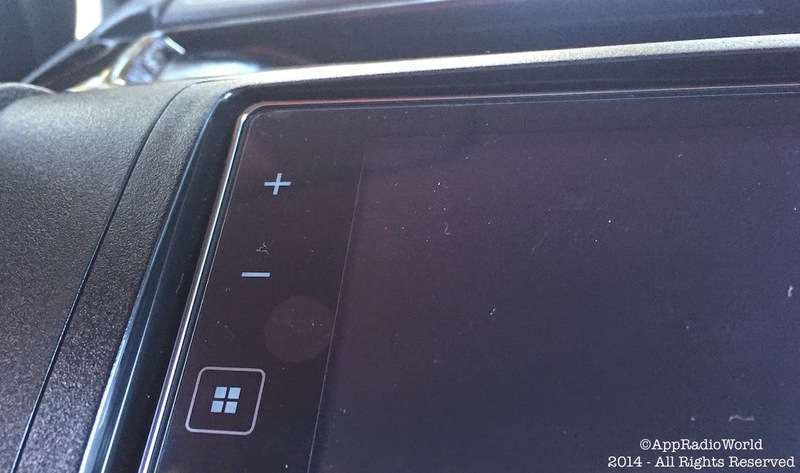 The AppRadio 4 display itself (minus the buttons) would require a smaller screen protector. But since the buttons sit flush with the screen, it's better to cover the entire front glass. Just to be sure, I left about a millimeter of space on each side and measured the screen. 1. Any iPad Air 2 or iPad Air matte screen protector: I found that the new iPad Air 2 or iPad Air has same width dimensions as what is needed for the AppRadio 4 - 165mm. So this would make the screen protector cutting job easier by not requiring cutting of the sides to get the perfect fit. The good thing about the iCarez is that you get a squeegee and cleaning cloth, along with lint-removal stickers which come in handy. 2. 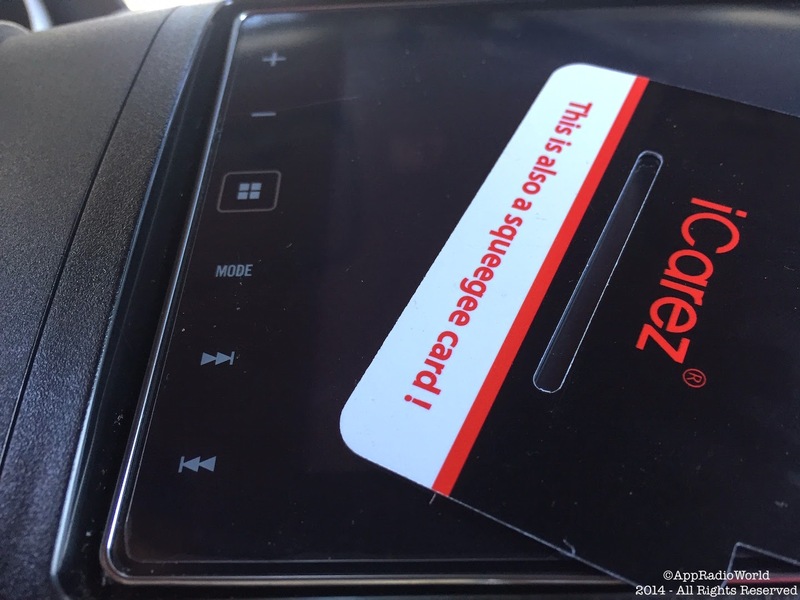 Squeegee and Lint-Removal microfiber cleaning cloth: You can use any hard plastic card (like a credit card) as a squeegee to remove any air bubbles that might form during installation. The lint-removal cloth can be any microfiber cloth used for cleaning spectacles or sunglasses. Both these items are included in the iCarez Screen Protector kit. 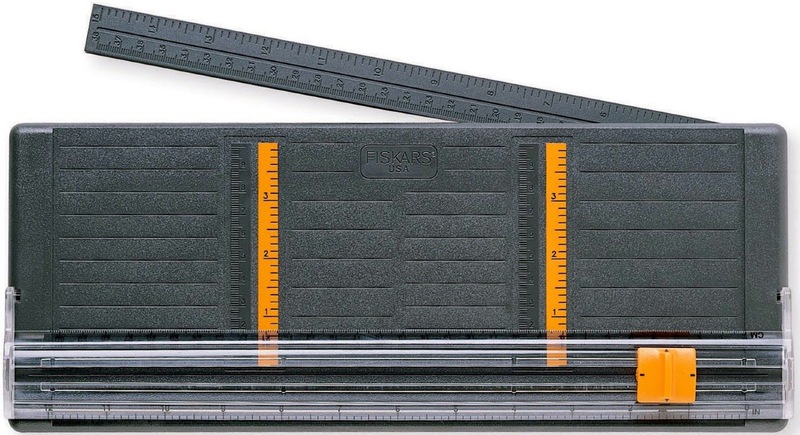 The trimmer makes perfectly straight cuts and allows accurate measurement while cutting. Alternatively, you can use any pair of scissors to cut the screen protector. 4. 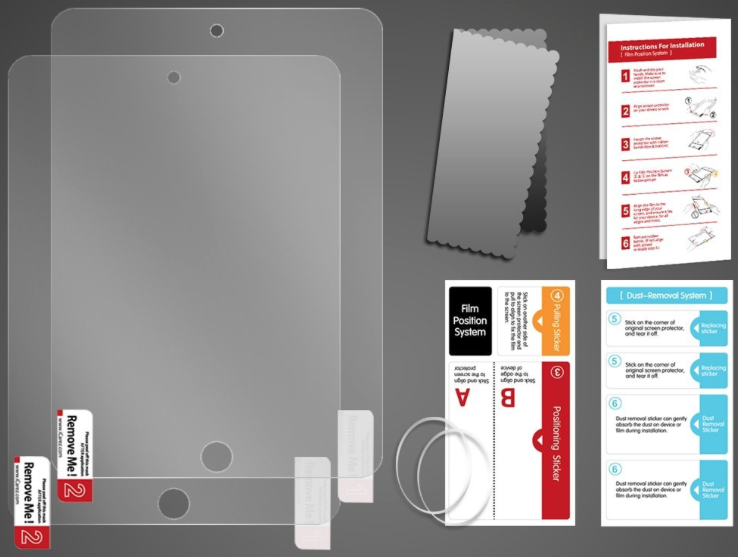 Any clear adhesive tape: This is used to lift the protective covering on the screen protector prior to installation. Any small piece of clear tape can be used. 1. 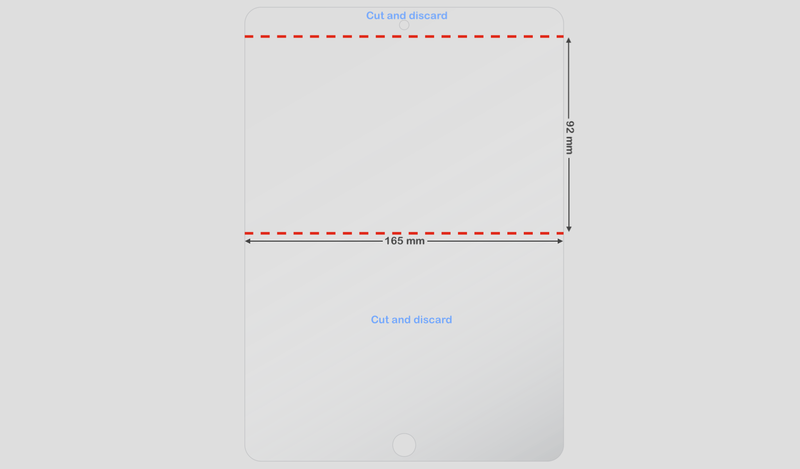 Cut the screen protector to size: Using your cutting tool (scissors or trimmer), cut the screen protector to the exact size (165 x 92 mm). Remember to cut and discard the holes in the screen protector for the iPad Air camera or home button. The sides will not require any cutting since the width is already 165mm. Measure to be sure. Remember to mark which side of the screen protector attaches to the screen. This should be done before cutting. 2. 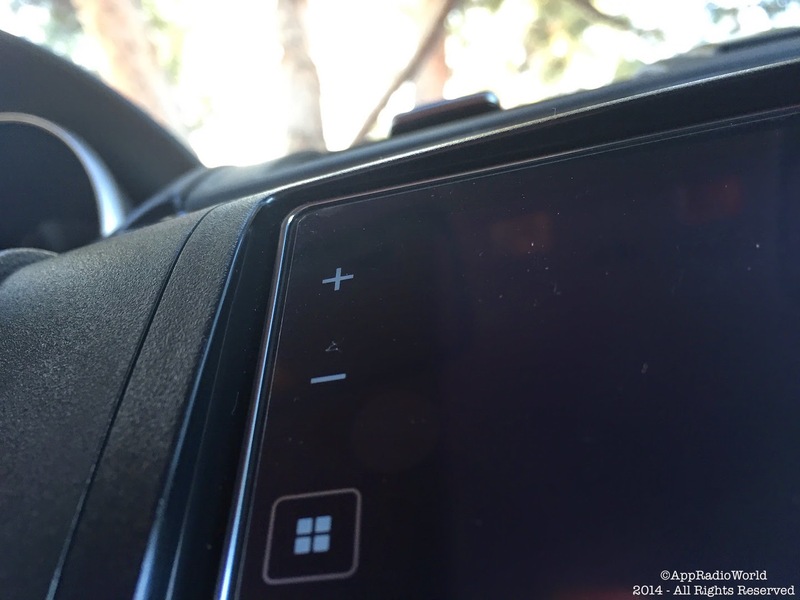 Round off the corners: If you notice, the AppRadio 4 screen has rounded edges. Using a pair of scissors, round off the corners of the screen protector. This will ensure a better fit. 3. Line it up before installing: To make sure you have cut out the correct size, line up the screen protector against the AppRadio 4 screen to make sure it will fit correctly. Do this before peeling off the protective covering. 4. 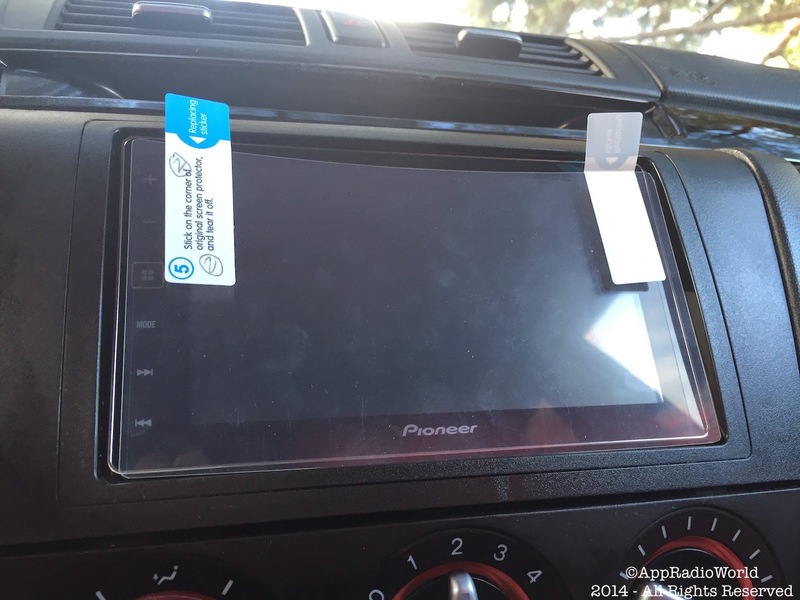 Clean and remove dust from the AppRadio 4: Using a microfiber cleaning cloth, wipe off any dust on the AppRadio 4 screen. Take your time with this. If you leave any dirt, lint or fingerprint marks, the installation will leave bubbles under the screen protector. I used an LCD/glass cleaning spray for better results. Spray a little diluted solution onto a cleaning cloth and wipe off the screen using circular motions. Make sure the solution dries up completely before installation. Another good method of removing dust is using a clear adhesive tape to lift it up. 4. Install: Make sure your car is turned off and your AppRadio 4 is powered off. 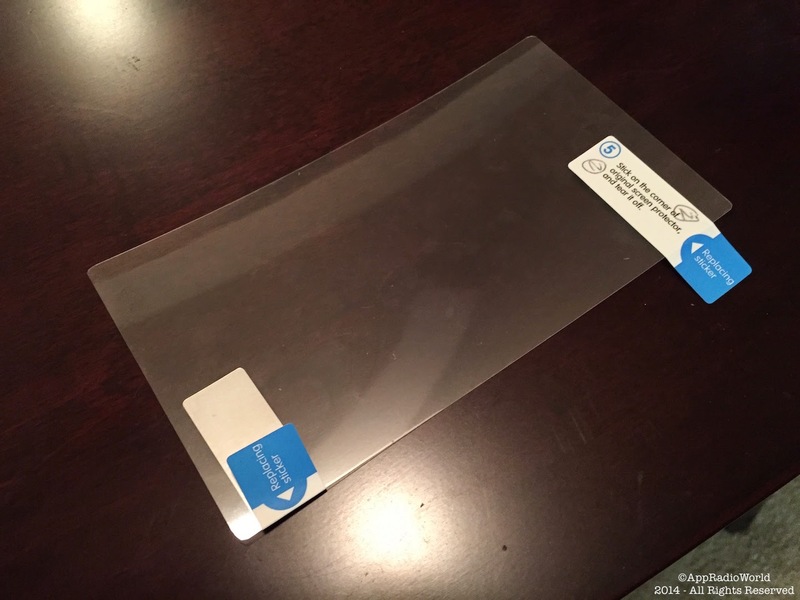 Stick a small piece of clear adhesive tape like a scotch tape, to any corner of the screen protector leaving a little piece of tape you can hold. Carefully lift about a two-inch width of the protective covering on the screen side of the protector using the tape. DO NOT REMOVE THE COVERING COMPLETELY. Align one side of the screen protector to the corners of the AppRadio 4 and place your thumb on the screen to stick the protector to it. From the underside, peel off the covering as you slide your finger to stick the screen protector. 5. Remove bubbles: Before removing the top layer of protective covering, use a squeegee (or any plastic card or credit card) to remove any bubbles. 6. Peel off the top layer: Using an adhesive tape, peel off the top layer of protective covering on the screen protector. Make sure you do this carefully and do not peel off the entire screen protector. Squeegee out any air bubbles. If you notice any dust particles under the screen protector, these can be removed by carefully lifting up the film using an adhesive tape. Watch the video above on how this is done. The process for the AppRadio 4 is similar. You will notice a marked difference in glare on the AppRadio 4 screen. Check out these finished results below. If you've found a better solution to this issue, let us know in the comments below. Also, if you've already installed a screen protector on your device, send me some pictures using the "Contact" tab above or on Twitter (@AppRadioWorld). Does this work with every double din headunit? 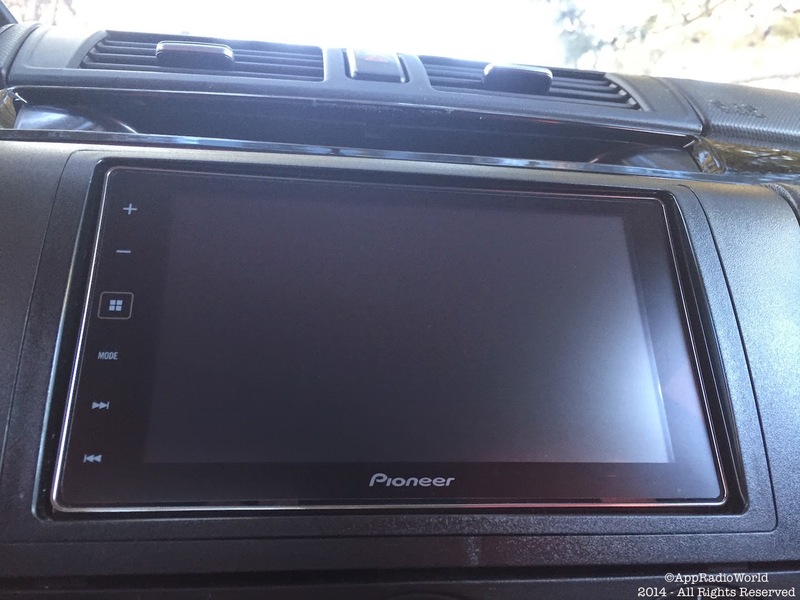 I have the Pioneer AVH5500BHS and would like to put this one mine if it does. I did this and works great. Makes a huge difference. Thanks a lot! 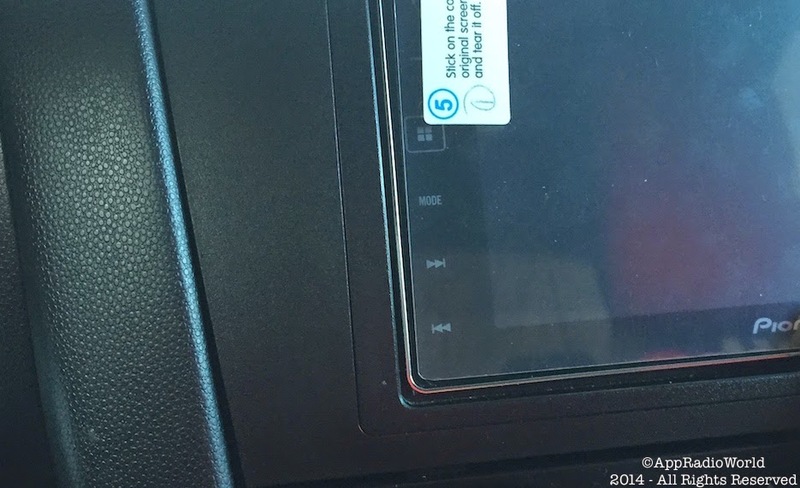 My only note would be the brightness doesn't change in CarPlay mode. At least mine doesn't.